Enteroids are emerging as a novel model in the study of human disease. The protocol describes how to simulate an enteroid model of human necrotizing enterocolitis using lipopolysaccharide (LPS) treatment of enteroids generated from neonatal tissue. 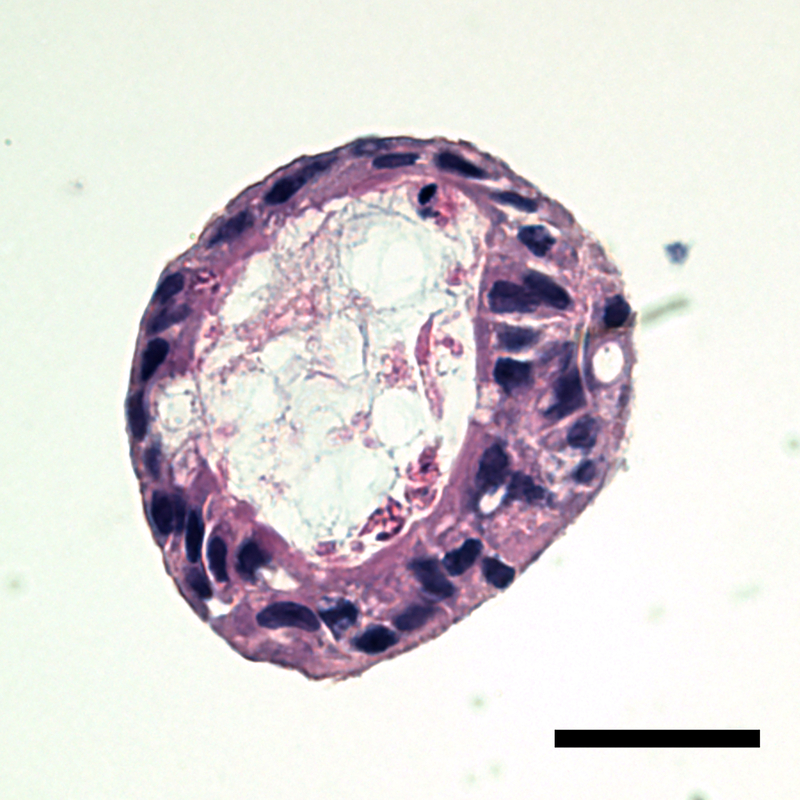 Collected enteroids demonstrate inflammatory changes akin to those seen in human necrotizing enterocolitis. Ares, G. J., Buonpane, C., Yuan, C., Wood, D., Hunter, C. J. A Novel Human Epithelial Enteroid Model of Necrotizing Enterocolitis. J. Vis. Exp. (146), e59194, doi:10.3791/59194 (2019). Necrotizing enterocolitis (NEC) is a devastating disease of newborn infants. It is characterized by multiple pathophysiologic alterations in the human intestinal epithelium, leading to increased intestinal permeability, impaired restitution, and increased cell death. Although there are numerous animal models of NEC, response to injury and therapeutic interventions may be highly variable between species. Furthermore, it is ethically challenging to study disease pathophysiology or novel therapeutic agents directly in human subjects, especially children. Therefore, it is highly desirable to develop a novel model of NEC using human tissue. 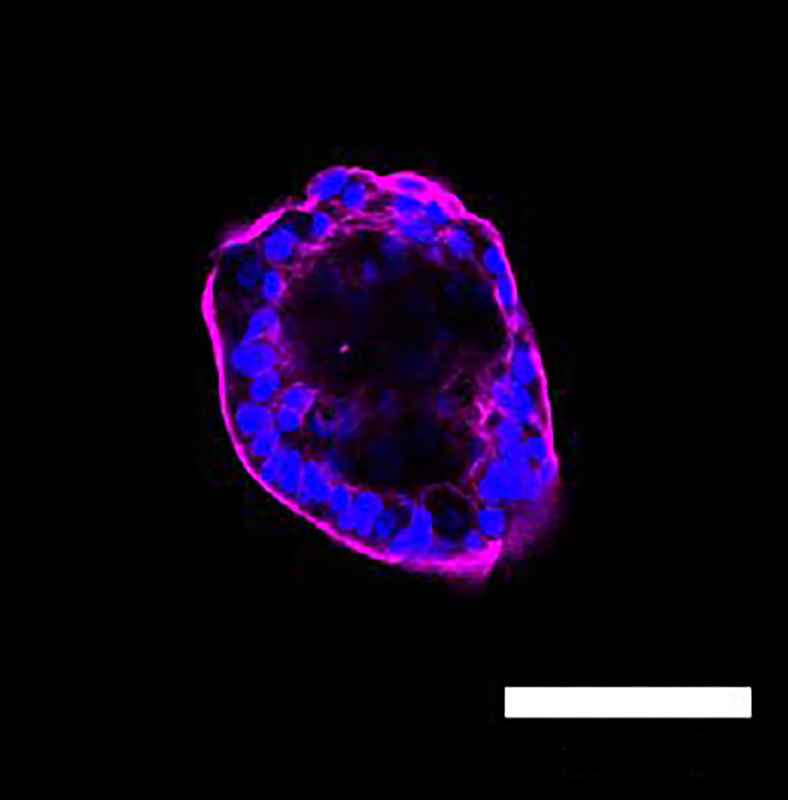 Enteroids are 3-dimensional organoids derived from intestinal epithelial cells. They are ideal for the study of complex physiologic interactions, cell signaling, and host-pathogen defense. In this manuscript we describe a protocol that cultures human enteroids after isolating intestinal stem cells from patients undergoing bowel resection. The crypt cells are cultured in media containing growth factors that encourage differentiation into the various cell types native of the human intestinal epithelium. These cells are grown in a synthetic, collagenous mix of proteins that serve as a scaffold, mimicking the extra-cellular basement membrane. As a result, enteroids develop apical-basolateral polarity. Co-administration of lipopolysaccharide (LPS) in media causes an inflammatory response in the enteroids, leading to histologic, genetic, and protein expression alterations similar to those seen in human NEC. An experimental model of NEC using human tissue may provide a more accurate platform for drug and treatment testing prior to human trials, as we strive to identify a cure for this disease. Human enteroids are an ex vivo 3-dimensional culture system generated from stem cells isolated from intestinal crypts of human intestinal tissue samples. This ground-breaking model was pioneered by Hans Clevers et al. in 2007 following the discovery of Lgr5+ stem cells at the crypts of small intestine in mice1. Their work laid the foundation for establishing an ex vivo intestinal epithelial culture of multiple cell types that could be passaged without significant genetic or physiologic changes2. Since this discovery, enteroids have been used as a novel model to study normal digestive physiology, and the pathophysiology of intestinal diseases such as inflammatory bowel disease, host-pathogen interactions, and regenerative medicine2. The use of enteroids as an ex vivo model for the study of intestinal pathophysiology has several advantages over alternative techniques. For the past several decades, animal models and immortalized intestinal cancer-derived cell lines have been used to study intestinal physiology3,4,5. Single-cell cultures do not represent the diversity of cell types present in normal intestinal epithelium, thereby lacking cell to cell cross-talk and segment-specificity in protein expression, signaling, and pathogen-induced disease6. Stem cells in enteroids differentiate into the major epithelial cell types such as enterocytes, Paneth cells, goblet cells, enteroendocrine cells and more3. They exhibit polarity, carry out epithelial transport functions, and allow for intestinal segment specificity6. Since enteroids can recapitulate the multiple cell types of human intestinal epithelium, they are able to overcome this recognized limitation of cancer cell-based systems. Over time, derivatives of cell lines are subcloned and evolve to exhibit greater diversity in protein expression and localization3. On the contrary, enteroids can be passaged without significant genetic or physiologic changes2. Although numerous animal models for NEC exist, response to injury and therapeutic interventions may be highly variable between species. As a result of these limitations, therapeutics derived from animal models fail 90% of the time when tested in human trials due to differences in toxicity or efficacy3. Enteroids serve as promising pre-clinical models that can overcome these deficiencies, leading to a better understanding of complex intestinal pathophysiology and therefore, more successful and cost-effective therapeutic innovations. There is also recent evidence that the age of the tissue that an enteroid is generated from remains biologically important7. This is an especially important detail for our model since enteroids are generated from neonatal tissue, thereby maintaining physiologic relevance to patients with NEC. The utility of enteroids as models of human illnesses continues to expand, in hopes of finding cures to severe and pervasive conditions. Necrotizing enterocolitis (NEC) is a devastating intestinal disease of neonates characterized by intestinal necrosis and frequently leads to perforation of the bowel wall, septicemia, and death8. Due to the complex and multifactorial pathophysiology of NEC, the exact mechanism of the disease has not yet been fully elucidated; however, increased intestinal permeability has been clearly implicated in the disease process8. Given that the study of NEC and potential therapeutic agents is ethically challenging in human subjects, especially children, it is highly desirable to utilize a biologically relevant enteroid model of NEC using human neonatal tissue. Thus far, enteroids have a limited role in the study of NEC. This protocol describes the use of enteroids derived from human intestinal tissue samples as a novel ex vivo model for the study of necrotizing enterocolitis. Institutional review board approval was obtained (IRB #2013-15152) for collection of tissue samples from patients undergoing bowel resection at Ann and Robert H. Lurie Children's Hospital of Chicago, Chicago, IL. All protocols were performed in compliance with institutional and national guidelines and regulations for human welfare. Written informed parental consent was required and obtained prior to sample collection in all cases. Prepare Culture Media stock solution for whole tissue collection: 1 L of Dulbecco's Modified Eagle Medium (DMEM), 110 mL of Fetal Bovine Serum (FBS), 11 mL of Penicillin-Streptomycin (final concentration 1%) and 1.1 mL of filter-sterilized insulin (final concentration 0.1%.) Store stock solution at 4 °C. Prepare Chelating Buffer #1: 30 mL of Culture Media (as described in 1.1), 600 µL of 0.5 M Ethylenediaminetetraacetic acid (EDTA) (final concentration 10 mM), 300 µL of Gentamicin (final concentration 1%) and 60 µL of Amphotericin B (final concentration 0.2%). Store stock solution at 4 °C. Prepare Chelating Buffer #2: 30 mL of Culture Media (as described in 1.1), 300 µL of 0.5 M EDTA (final concentration 5mM), 300 µL of Gentamicin (final concentration 1%) and 60 µL of Amphotericin B (final concentration 0.2%). Store stock solution at 4 °C. Prepare Human Minigut Media: 41.4 mL of DMEM/F-12, 5 mL of FBS (final 10%), 500 µL of Penicillin-Streptomycin (final concentration 1%), 500 µL of L-glutamine (final concentration 1%), 500 µL of Gentamicin (final concentration 1%), 100 µL of Amphotericin B (final concentration 0.2%), 500 µL of 1 M N-2-hydroxyethylpiperazine-N-2-ethane sulfonic acid (HEPES) (final concentration 10 mM), 500 µL of 100x N-2 supplement, and 1 mL of 50x B-27 supplement minus Vitamin A for a total volume of 50 mL. Store stock solution at -20 °C. Prepare Human Minigut Media Complete: 10 mL of Human Minigut Media (prepared in 1.4), 10 µL of 100 µg/mL Wnt3a (final concentration 100 ng/mL), 10 µL of 100 µg/mL Noggin (final concentration 100 ng/mL), 10 µL of 1 mg/mL R-Spondin (final concentration 1 µg/mL), 10 µL of 500 µg/mL Epidermal Growth Factor (EGF) (final concentration 50 ng/mL), 10 µL of 1 M N-Acetylcysteine (final concentration 1 mM), 10 µL of 10 mM Y-27632 (final concentration 10 µM), 10 µL of 500 µM A-83 (final concentration 500 nM), 10 µL of 10 mM SB202190 (final concentration 10 µM), 100 µL of 1 M Nicotinamide (final concentration 10 mM) and 1 µL of 100 µM [leu] 15-gastrin 1 (final concentration 10 nM). Total volume 10 mL. Store stock solution at 4 °C. NOTE: Solutions must be used within 48 h.
At the time of collection in the operative suite, place the human small intestinal tissue sample in cold Dulbecco's Phosphate Buffered Saline (DPBS). Wash the specimen in cold DPBS until clear of stool and blood. Store specimen at 4 °C in RPMI 1640 Medium until ready for crypt isolation. NOTE: Tissue cannot be stored more than 24 h.
Make sure that the specimen is clear of stool and blood. Using delicate dissecting scissors, remove any excess fat or surgical clips/staples etc. Weigh the specimen. NOTE: Aim for a piece approximately 0.75-2.5 g.
Cut the specimen into 0.5 cm pieces and place in 30 mL of Chelating Buffer #1 (as prepared in step 1.2). Shake at low speed for 15 min at 4 °C. Filter tissue through 100 µm cell strainer and discard flow through. Add the tissue to 30 mL of Chelating Buffer #2 (as prepared in step 1.3). Filter tissue through a 100 µm cell strainer and discard flow through. Thaw 500 mL of basement membrane matrix on ice for use in step 2.8. Add tissue to 10 mL of cold DMEM in a 50 mL conical tube and shake vigorously by hand for 10 s.
Filter through a 100 µm cell strainer and collect flow through (Label #1). Keep tube #1 on ice. Add tissue to another 10 mL of cold DMEM in a separate 50 mL conical tube and shake vigorously by hand for 10 s.
Filter through a 100 µm cell strainer and collect flow through (label #2). Repeat two additional times until there are four conical tubes with flow through (labeled tubes #1-4). Filter tube #1 solution through a 100 µm cell strainer and transfer flow through into 15 mL conical tube (Label #1). Repeat for #2-4. Centrifuge 15 mL tubes #1-4 at 200 x g for 15 min at 4 °C. In the laminar flow hood, remove the supernatant from tubes #1-4 and discard. Avoid disrupting the cloud of tissue immediately above the pellet, even if that means leaving some supernatant behind. By pipetting slowly, mix together the pellet with the leftover supernatant in tubes #1-4. Transfer the mixture from tubes #1-4 into one single 2 mL conical tube. Centrifuge the conical tube at 200 x g for 20 min at 4 °C. Remove the supernatant and re-suspend the pellet in 500 µL of basement membrane matrix. NOTE: Keep the basement membrane matrix on ice at all times and work quickly for the next steps. This product polymerizes very quickly at room temperature. Apply 50 µL of specimen/basement membrane matrix suspension to the center of a well in a 24-well plate. This should appear dome-shaped. NOTE: Use of chilled pipette tips aids in smoother transfer of the suspension, minimizing polymerization. Repeat 9 times to fill 10 total wells. Place the 24-well plate in 37 °C, 5% CO2 incubator for 30 min to allow polymerization. Add 500 µL of Human Minigut Media Complete (as prepared in step 1.5) to each well. Replace every 2 days. Collect enteroids after 5-10 days, when budding is visualized. See Steps 4 and 5 for collection instructions. Add 10 µL of 5 mg/mL of lipopolysaccharide (LPS) to 500 µL of Human Minigut Media Complete (as prepared in step 1.5) in each well on Day 0. Replace every 2 days until collection. Add 1 mL of PBS and gently pipette up and down to dissolve the basement membrane matrix with care not to lyse the enteroids. Centrifuge PBS/enteroid mixture at <300 x g for 5 min to pellet and remove PBS. Add 4% paraformaldehyde to fix at room temperature for 1 h.
Centrifuge at <300 x g for 5 min to pellet, and then remove PBS. Wash gently with 1 mL of PBS and centrifuge at <300 x g for 5 min to pellet, and then remove PBS. Melt a sufficient volume of the tissue processing gel (around 300 µL) by placing the desired amount in a conical tube and warming it in a dry bath incubator at 65 °C for 3-10 min until liquid. Add the tissue processing gel to the pellet and mix gently. On a coverslip, place a small cloning ring. Pipette the tissue processing gel and enteroid mixture into a cloning ring mounted onto a coverslip. Allow the tissue processing gel and enteroid mixture to solidify at 4 °C for 1 h.
Submerge the cloning ring with solidified mixture into 70% ethanol in preparation for paraffin embedding. Gently remove Human Minigut Media Complete from each well. Add 1 mL PBS and gently pipette up and down to dissolve the basement membrane matrix. Be careful not to dissociate the enteroids. Place PBS/enteroid mixture into a sterile 2 mL conical tube. Centrifuge at <300 x g for 5 min to pellet. Gently remove PBS, taking care not to remove the enteroids. Repeat step series 5.2 two more times. Freeze in -80 °C until ready for protein and/or RNA extraction. Perform gene expression and protein isolation of the enteroids using well-established qRT-PCR and Western Blotting techniques. Immediately after plating, the freshly isolated intestinal crypts appear as elongated rods. Within hours, the enteroid will take on a round appearance (Figure 1a). Over the next several days, the enteroids will start forming spheres as seen in Figure 1b. Budding should occur between 5-10 days (Figure 1c) and enteroid collection should occur at that time. The growing enteroids will also exhibit polarity, containing a centralized lumen, an apical border and a basolateral domain (Figure 2). Enteroids also show structural integrity, represented by a robust actin cytoskeleton (Figure 3). After several days in culture, the LPS treated enteroids experience more apoptosis and will have a lower yield than the control group (Figure 4). 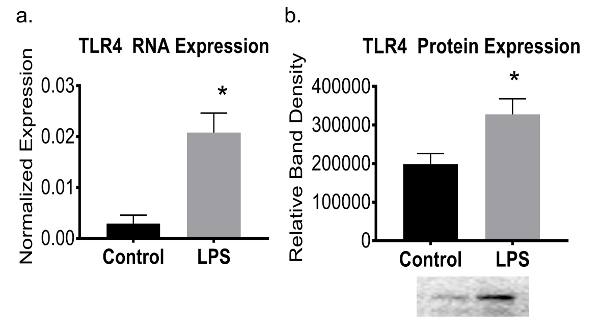 As seen in human NEC and murine models of NEC9, an increased expression of Toll-like receptor 4 (TLR4) was found in LPS treated enteroids compared to controls (Figure 5). Figure 1: Crypt culture and human enteroid formation from whole tissue. (a) Day 0 crypt culture with round, flat appearance. (b) Day 4 enteroids with spheroid formation. (c) Day 7 enteroids with budding (black arrow). Scale bars = 50 µm. Please click here to view a larger version of this figure. Figure 2: Histological appearance of an enteroid. Haemotoxylin and Eosin staining. The enteroid displays a centralized lumen and exhibits polarity, with both an apical and basolateral domain. The haemotoxylin (purple) represents the nucleus, whereas the eosin (pink) represents cytosolic components. Scale bar = 20 µm. Please click here to view a larger version of this figure. Figure 3: Enteroid actin cytoskeleton. Immunoflorescence micrograph of an enteroids. The enteroid displays structural integrity as demonstrated by the prominent actin cystoskeleton (magenta). Nuclei stained with DAPI (blue), Scale bar = 100 µm. Please click here to view a larger version of this figure. Figure 4: Human enteroid culture yield is decreased with LPS treatment. Day 5 enteroids in culture, grown from the same whole tissue sample. (a) Enteroids treated with control culture media. Display robust growth. (b) Enteroids treated with LPS in culture media. Only a few surviving enteroids. Scale bar = 200 µm. Please click here to view a larger version of this figure. Figure 5: Increased TLR4 expression in experimental NEC enteroids. (a) qRT-PCR showed increased TLR4 mRNA expression in enteroids exposed to LPS (p = 0.03). (b) Western blot analysis showing increased TLR4 expression in experimental human enteroid NEC (p = 0.02). Representative western blot depicted. Values are means ± SEM of 3 samples per group. *p < 0.05 by Student's t test. Please click here to view a larger version of this figure. This novel ex vivo human intestinal enteroid model serves as a useful method for the study of intestinal barrier dysfunction in necrotizing enterocolitis (NEC). The enteroid processing methods presented here were adapted from the previous work of Drs. Misty Good, Michael Helmrath and Jason Wertheim10,11,12. Details surrounding the whole tissue collection and timing of crypt isolation are critical steps in this protocol. Tissue must be collected immediately at the time of operative resection and processed for crypt isolation as soon as the tissue arrives in the lab. We selected tissue from patients less than 3 months old for this model. Delayed processing can occur within 24 h after whole tissue collection if needed. Additionally, the quality of the human tissue sample greatly affects the yield of crypt isolation. Healthy small intestine without underlying pathology and from younger patients (<2 months of age) have been found to yield the best results. Additionally, the collected tissue should be chosen from the healthiest area, typically at the distal ends of the resected specimen. Using a larger piece of intestine does not improve crypt isolation with the described solution volumes in the protocol above. Intestinal segments approximately 1-2 cm in length, weighing 0.75-2.5 g are optimal. The induction of experimental NEC via LPS exposure was modeled from well-established cell culture and animal models. The established work of Hackam et al. showed the critical role of TLR4 (LPS receptor) in NEC development9,13,14,15. LPS activation of TLR4 stimulates proinflammatory cytokines, a reduction in barrier integrity, and activation of subepithelial leukocytes that characterize the signaling events involved in human NEC. TLR4 has been implicated as a key molecule in promoting inflammation7 and animals that lack functional TLR4 are have demonstrated protection from the development of NEC15. Circulating levels of LPS are elevated in patients with NEC and elevated in stool and plasma of animal models of NEC. LPS induces intestinal inflammation in animals that resembles human NEC, which highlights the significance of inflammation in this pathway. Mirroring the established cell culture and animal models of NEC, we believe that induction of experimental NEC via LPS administration in enteroid culture is a useful ex vivo human neonatal model for the study of NEC. In line with previous reports in other established models, our experimental NEC enteroids demonstrated increased expression of TLR4 compared to controls. The protocol for induction of experimental NEC via LPS exposure has undergone several important modifications and improvements. Initially, enteroids were grown for 5 days, then inoculated with LPS for 24 h and subsequently collected. The protocol now recommends LPS inoculation on day 0 with continued exposure in every culture media change until collection. Additionally, the dosage of LPS was optimized. After performing a dose curve and trialing several different LPS concentrations, 5 mg/mL was selected. Experimentation with LPS inoculation directly into the basement membrane matrix/enteroid mixture at the time of plating was also trialed; however, this was cumbersome and did not improve results. There are limitations that should be addressed as the utilization of the human enteroid model evolves. Since the discovery in 2007, several different protocols have been used to establish and culture enteroids. The numerous growth factors required for enteroid maintenance and differentiation lack standardization, which may affect reproducibility. Additionally, enteroid culture lacks mechanical forces that affect the human intestinal epithelium in physiologic conditions. Pressure from luminal flow and peristalsis may influence gene and protein expression, which is not accounted for in this model. This model also lacks nerves, immune cells, a microbiome, vasculature and mesenchyme that are present in human intestinal epithelium. Exposure to LPS in this human intestinal enteroid model causes an inflammatory response leading to histologic, genetic, and protein expression alterations similar to those found in human NEC. Although there are several current animal models of NEC, response to intestinal injury and therapeutic interventions varies widely between species. Since it is ethically challenging to study disease pathophysiology or to test novel therapeutic agents directly in humans, especially infants, it is exceedingly important to continue to cultivate this novel ex vivo model of NEC using human tissue. Human enteroids are amenable to genetic modification and may be fundamental in the development of therapies for many human intestinal diseases16. Future directions should aim to culture human enteroids on a permeable scaffold in a perfusion chamber with apical and basolateral flow to in order to reproduce in vivo crypt-villus architecture as well as physiologic forces such as peristalsis and luminal flow. This work was supported by the National Institute of Health Institute of Diabetes and Digestive and Kidney Disease Grant (K08DK106450) and the Jay Grosfeld Award from the American Pediatric Surgical Association to C.J.H. Sato, T., et al. Single Lgr5 stem cells build crypt-villus structures in vitro without a mesenchymal niche. Nature. 459, (7244), 262-265 (2009). Zachos, N. C., et al. Human Enteroids/Colonoids and Intestinal Organoids Functionally Recapitulate Normal Intestinal Physiology and Pathophysiology. The Journal of Biological Chemistry. 291, (8), 3759-3766 (2016). Foulke-Abel, J., et al. Human enteroids as an ex-vivo model of host-pathogen interactions in the gastrointestinal tract. Experimental Biology and Medicine (Maywood). 239, (9), 1124-1134 (2014). Hidalgo, I. J., Raub, T. J., Borchardt, R. T. Characterization of the human colon carcinoma cell line (Caco-2) as a model system for intestinal epithelial permeability. Gastroenterology. 96, (3), 736-749 (1989). Hilgers, A. R., Conradi, R. A., Burton, P. S. Caco-2 cell monolayers as a model for drug transport across the intestinal mucosa. Pharmaceutical Research. 7, (9), 902-910 (1990). In, J. G., et al. Human mini-guts: new insights into intestinal physiology and host-pathogen interactions. Nature Reviews Gastroenterology & Hepatology. 13, (11), 633-642 (2016). Senger, S., et al. Human Fetal-Derived Enterospheres Provide Insights on Intestinal Development and a Novel Model to Study Necrotizing Enterocolitis (NEC). Cell and Molecular Gastroenterology and Hepatology. 5, (4), 549-568 (2018). Moore, S. A., et al. Intestinal barrier dysfunction in human necrotizing enterocolitis. Journal of Pediatric Surgery. 51, (12), 1907-1913 (2016). Neal, M. D., et al. A critical role for TLR4 induction of autophagy in the regulation of enterocyte migration and the pathogenesis of necrotizing enterocolitis. The Journal of Immunology. 190, (7), 3541-3551 (2013). Lanik, W. E., et al. Breast Milk Enhances Growth of Enteroids: An Ex Vivo Model of Cell Proliferation. Journal of Visualized Experiments. (132), 56921 (2018). Mahe, M. M., Sundaram, N., Watson, C. L., Shroyer, N. F., Helmrath, M. A. Establishment of human epithelial enteroids and colonoids from whole tissue and biopsy. Journal of Visualized Experiments. (97), 52483 (2015). Uzarski, J. S., Xia, Y., Belmonte, J. C., Wertheim, J. A. New strategies in kidney regeneration and tissue engineering. Current Opinion in Nephrology and Hypertension. 23, (4), 399-405 (2014). Leaphart, C. L., et al. A critical role for TLR4 in the pathogenesis of necrotizing enterocolitis by modulating intestinal injury and repair. The Journal of Immunology. 179, (7), 4808-4820 (2007). Neal, M. D., et al. Enterocyte TLR4 mediates phagocytosis and translocation of bacteria across the intestinal barrier. The Journal of Immunology. 176, (5), 3070-3079 (2006). Sodhi, C. P., et al. Intestinal epithelial Toll-like receptor 4 regulates goblet cell development and is required for necrotizing enterocolitis in mice. Gastroenterology. 143, (3), 708-718 (2012). Koo, B. K., et al. Controlled gene expression in primary Lgr5 organoid cultures. Nature Methods. 9, (1), 81-83 (2011).